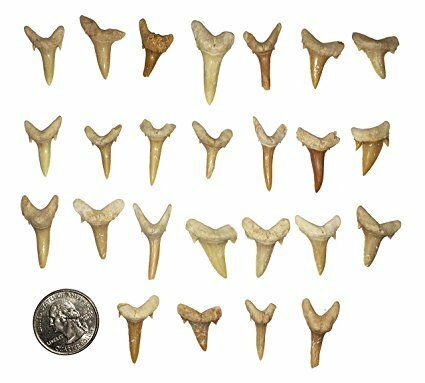 (1) Bag of 25 fossilized shark teeth. These teeth are about 90% complete. Please look closely at the sample photo. Some teeth may have small chips or breaks. Each lot of 25 teeth will arrive in a resealable storage bag. These shark teeth are up to 65 million years old! Please note these shark teeth are selected at random, so please allow for slight variation in the quality, size, and overall appearance of these teeth. These teeth are a small/medium size, please look at the photo and use the quarter for size comparison. (1) Bag of 25 fossilized shark teeth. These teeth are about 90% complete. Please look closely at the sample photo. Some teeth may have small chips or breaks. Each lot of 25 teeth will arrive in a resealable storage bag. These shark teeth are up to 65 million years old! Please note these shark teeth are selected at random, so please allow for slight variation in the quality, size, and overall appearance of these teeth. These teeth are a small/medium size, please look at the photo and use the quarter for size comparison. If you have any questions about this product by goldnuggetminer, contact us by completing and submitting the form below. If you are looking for a specif part number, please include it with your message.